In the past, precision woodworking wasn't the domain of some power tool or clever gizmo bought from a modern scratch n' sniff catalog. That chore was left to the skill of the woodworker, which as it should be, to separate the men from the boys. Precision work starts with precision layout, and precision layout is what you'll get with this tool that works as well as it looks. The machined blade, bevelled along two edges to permit it working left or right handed, is tempered to Rc61. The backside of the blade is flat so that you can reference it off your favorite square, sliding bevel, straight edge, etc. The blade is honed (left to the purchaser) just like a common paring chisel is so that the knife cuts the wood, leaving a line that's but a hair's width in dimension. Certainly, this method of marking is much better than a pencil, and the masters of yesteryear relied upon such a tool daily to work their magic. Now, you might ask yourself how you can effectively use such a tool in your day to day woodworking life. One of the most common applications at which the knife excels is striking the shoulders of tenons. In fact, the tool actually helps you cut better shoulders. How's that? With the square at the required distance from the end of the stock, you orient the knife with its flat side against the square's blade and then run the knife along the square to cut the wood's fibers. You then take the knife and run it to the waste side of the shoulder, driving it into the wood at an angle, so that it pares away a shallow notch. In this notch you then run the saw, which now has a perfect track to guide it. Using this method, you'll no longer suffer skipping and jumping of the saw, which makes for ratty shoulders or inadvertant cuts in places you don't want them. 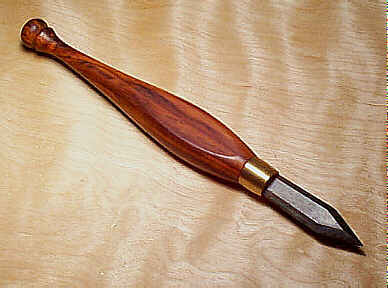 The handle is turned of select cocobolo with the turning being a graceful, elegant, and comfortable shape. It feels as natural in your hand as a pencil does. Opposing sides are purposely flattened so that the knife won't roll around or off the bench. A tapered brass ferrule gives the tool a classic look, reminiscent of the past's finest chisels. The knife is not some modern design, but is, instead, a perfect copy of an original that once belonged to a pipe organ builder, C. Carlson, who was working in Worcester, Massachusetts during the late 1800's to early 1900's. Organbuilding is a precision trade, and only the best tools would satisfy members of the exclusive group. Patternmakers, practitioners of exacting work, also made use of similar knives and even to this very day several patternmakers are using this tool in their day-to-day work.